"This wine is always a real SMASH!" Best served when celebrating a tennis victory. Specially selected by Helen & Jenny. 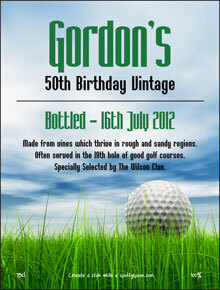 Looking for an unusual gift idea for a friend or relation who enjoys tennis and wine. This tennis wine label has a tennis court theme which will transform an ordinary bottle of wine into a 'smashing' tennis gift. Ideal for lovers of tennis, whether they play singles, doubles, mixed doubles or just like a knockabout on a court. It has a real tennis ball ace image and is sure to make a splash. 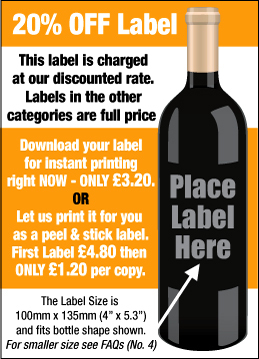 Simply add the personal details and download it for printing at home or let us print it for you onto our tough and easy to use peel and stick wine labels. Based on a strong tennis theme this design will suit anyone who likes to swing a racquet, whether it's their 18th, 21st, 25th, 30th, 40th, 50th or 60th birthday. Includes their birthday, age and allows you to add text to make it funny and unique. 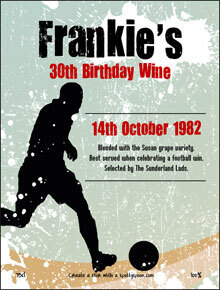 Note - good phrases which work for wine gifts and tennis players are 'Guaranteed to ace you every time', 'Sure to win out Game, Set & Match over the competition', 'Made from vines which thrive on baselines', 'The choice of future Wimbledon champions' etc.